Around 2:00 am on Tuesday, July 4, Governor LePage signed the biennial budget that had been delivered to him moments before by the Secretary of the Maine Senate, Heather Priest, accompanied by Senator James Hamper (R) Oxford County, Chair of the Appropriations and Financial Affairs Committee. This put the state back in business, having been in shutdown status since midnight, Friday, June 30, when the previous budget expired. The largest barriers to break through in the budget-building process included appropriating the largest increase in education funding in the state’s history, while also repealing the 3% tax surcharge on household incomes over $200,000, and removing a proposed 1.5% increase in Maine’s lodging tax. In last-minute negotiations to remove the lodging tax, additional funds for Head Start and other services that had previously been removed during the budget process were reinstated. On Wednesday, July 12, the Appropriations and Financial Affairs Committee met to consider bills assigned to the Special Appropriations Table. These bills have been finally enacted in the House, but require funding by the Appropriations Committee before being finally enacted in the Senate. The Appropriations Committee decides which bills to return to the Senate for final enactment. The Appropriations Committee was three members short Wednesday, with Republican Senate Chair Jim Hamper, Democratic Senator Cathy Breen, and Democratic Representative John Martin absent. House Assistant Minority Leader Jared Golden, however, was appointed by Speaker Sara Gideon to fill Rep. Martin’s seat for the meeting. This appointment maintained the Democratic majority on the Appropriations Committee and foreclosed the possibility of tie votes. With only $9 million in funding available for over 134 bills, it was no surprise that few were approved by the Appropriations Committee. Most of the bills were carried over to the next legislative session, where they will be reconsidered if there is additional funding. These carried-over bills will remain on the Special Appropriations Table unless specifically sent back to committee. Some bills with a higher price tag were voted Ought Not to Pass, and will die in the Senate. A few bills received Ought to Pass or Ought to Pass as Amended votes, but only four bills received a unanimous Ought to Pass vote from the Committee, with the rest largely divided on party lines. Senator Roger Katz did break with the House Republicans on several votes, tracking the pattern that shaped up during the budget negotiations, with Senate Republicans supporting initiatives opposed by House Republicans. The Committee tabled a few bills for further consideration, and they will likely take those up on Monday, July 17, when they meet again. The Appropriations and Financial Affairs Committee has noticed for public hearing on Monday, July 17 several pending bond bills that would send questions to the voters asking if they support a state-issued bond to pay for certain initiatives. Currently, the Committee has 37 proposed bond bills in front of it, but Chairman Drew Gattine indicated at the end of a Committee meeting on Wednesday that the Committee would reconvene on Monday to take up only a few of those. It's not clear what the plan is to decide on the remaining bills, but it's possible the Committee may meet again later next week as well. The Committee will also take up other unfinished business during the meeting on Monday. 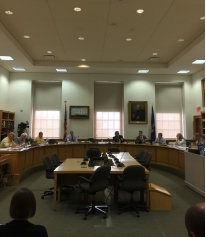 The Joint Select Committee on Marijuana Legalization Implementation met twice this week and is working hard to design an implementation plan for the retail sales of marijuana in Maine. The Committee, which was established in the wake of the Fall 2016 referendum question on marijuana, has been meeting throughout the legislative session, but is now meeting even more frequently to try to hammer out answers to lingering questions about marijuana legalization including how it will be taxed, how it will be tested, who will be able to sell it, and what products will be authorized by the state. Committee Co-chair Senator Roger Katz said to Maine Public Broadcasting this week that Maine could have marijuana retail sales set up by next summer, but added that could be an ambitious timeline. The Committee hopes to have a bill to introduce to the Legislature in the Second Regular Session that convenes in January 2018, which would put the framework in place for retail sales. Currently, retail sales are prohibited until February 2018, but the Legislature could extend that date. The Legislature will reconvene on Thursday, July 20 to take up unfinished business, as well as to address the bills voted off the Special Appropriations Table and any bond bills approved by the Appropriations and Financial Affairs Committee. The Legislature will also take action on several gubernatorial vetoes that have occurred during the last couple of weeks. In addition to those vetoes, it's anticipated that the Governor may veto some of the bills that the Legislature will take up on the 20th. In order to have an opportunity to act on those vetoes, the Legislature will likely meet again for so-called “veto day” that would be held at least ten days (Sundays excluded) after the 20th. As the Legislature winds down its business, the race for the Governor's office is heating up. On Monday, July 10, Attorney General Janet Mills announced her candidacy. Mills has been an outspoken opponent of many of Governor LePage's policies. Additionally, on Thursday, July 13, former Speaker of the House Mark Eves declared his candidacy. They join the race for the Democratic nomination with businessman and veteran Adam Cote, liberal activist Betsy Sweet, and military retiree Patrick Eisenhart, who have already declared their candidacies. On the Republican side, former Commissioner of Health and Human Services Mary Mayhew has announced that she will be running, along with political newcomer Deril Stubenrod, who was the first to declare in February. Additionally, Libertarian Richard Light has entered the field as an independent candidate. Late last week, former Senate President Justin Alfond announced that he would not seek the office at this time. Even as the field shapes up, all eyes continue to be on Senator Susan Collins, who has expressed interest in a possible run for Governor. We also hear rumors that Congresswoman Chellie Pingree is exploring the possibility as well. Clearly, voters will have no shortage of choices in the race for Governor in 2018. As one member of the Governor's staff is set to depart, another is coming in. Adrienne Bennett, long-time press secretary for Governor Paul LePage, has decided to leave the Governor's office for the private sector. In his message announcing her departure, Governor LePage praised Ms. Bennett for her work. Her last day is set to be August 2. Governor LePage also announced that Nick Adolphsen, the former Director of Government Relations and Policy at the Department of Health and Human Services, has joined the Governor's office as the Senior Health Policy Advisor. Adolphsen replaces David Sorensen, who left earlier this year to become a speechwriter in the Trump Administration. The Appropriations and Financial Affairs Committee meets to vote on bills on the Special Appropriations Table on July 12. Committee Members present on the 12 from left to right: Representative Heather Sirocki (not in photo), Representative Jeff Timberlake, Representative Stedman Seavey, Representative Tom Winsor, Senator Roger Katz, Representative Drew Gattine, Representative Jared Golden, Representative Brian Hubble, Representative Denise Tepler, Representative Aaron Frey.